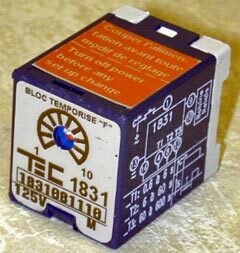 Timer module, based on an electronic technology grouping components ensuring timing and counting functions and controlling an output relay type GE or 1804. Timing adjustable in 3 ranges from 0.6 to 600 sec. Ranges selection by strapp on the basis. Time selection by potentiometer on front face. For any complementary information regarding mounting of withdrawal, please refer to the technical support pages of this site or contact us.